The ASUS VivoBook S400C offers plenty of value for money, especially if you can find it for just over $800. It has a strong CPU, good storage, a decent touchscreen and keyboard and a good range of built-in ports. Battery life is also relatively long. It's good for students and even business users who want something inexpensive to do double duty at home and at the office. This conventional-looking 14-inch ASUS Ultrabook turns out to be not so conventional when you find out that its screen has a touch interface. It's one of those laptops that you can point and swipe at when you want to navigate the Windows 8 Start screen and any full-screen apps running under that environment, and because it's a full-blown notebook computer you get good performance for mainstream tasks. However, the touchscreen is very reflective and it's useful only for basic navigation rather than a complete touch experience. The style of the ASUS S400C (specific model S400CA-CA012H) is similar to that of the Zenbook when it's open, but it's not as thin or as light. There is a brushed aluminium lid and the chassis tapers a little towards the front to give the notebook a wedge-like look. It's a design that can rest easily in your lap when you want to get some typing done while on the go, and at 1.85kg it's not too heavy to carry around on a daily basis. It would be a great computer for a student or office worker, and it's not overly expensive either. The retail price for Intel Core i5-bsed version that we looked at is $999, but we found it online for as low as $828 at the time of writing. You can find a decent range of connectivity around the VivoBook's edges, with the right side housing one USB 3.0 port, an HDMI port, a VGA port, Gigabit Ethernet and the power port. The left side has two more USB 2.0 ports, a combination headphone and microphone port and an SD card slot. We like the inclusion of the Ethernet and VGA ports, which should appeal to many users (and perhaps those who want to use this notebook for the office), but it's a shame that only one of the USB ports supports USB 3.0. On the inside, the VivoBook's engine room houses an Intel Core i5-3317U CPU, 4GB of DDR3 SDRAM, integrated Intel HD graphics and a 500GB hard drive. Importantly, it also has a 24GB solid state drive, which improves the laptop's boot time and overall responsiveness. In our tests, it took the S400C barely 12sec go from a cold boot to the Windows 8 login screen, which is a very swift result. Resume time from sleep was just over 2sec. The rest of the laptop's performance was as good as we expected. Its times of 49sec in Blender3D, 60sec in iTunes and 56min in AutoGordianKnot are very similar to those obtained by other laptops that use the same CPU, such as the Lenovo Twist and the Toshiba Z930, for example. The left side, which has a cable lock facility, two USB 2.0 ports, a headphone/microphone combination port and an SD card slot. The right side, which has a USB 3.0 port, an HDMI port, a VGA port, a Gigabit Ethernet port and the power port. Graphics are handled by the CPU, which means you're not going to get great gaming performance out of this laptop, but it will handle games from the Windows Store without any troubles. Its score of 4199 in 3DMark06 is on the high side for this class of notebook. We've recently started testing with the new 3DMark, which has three tests that are designed for use on low-end (Ice Storm test), mid-range (Cloud Gate test) and high-end computers (Fire Strike). In the Ice Storm and Cloud Gate tests, the S400C recorded 29403 and 3095 marks, respectively. To put these scores in perspective, a high-end PC such as the Venom Blackbook (and the only other computer we've used this benchmark on), recorded 87216 and 15411 in those same tests, so you can see that the ASUS is not ideally suited for intense 3D graphics processing. It has plenty of storage though. Because it's a low-cost computer, you won't find a solid state drive-based system disk; instead the VivoBook makes use of a hybrid solution that consists of a conventional 500GB, 5400rpm Seagate drive for the operating system and all of your data, and a 24GB SanDisk solid state drive that acts as a cache and which can boost system boot time and overall system performance. In CrystalDiskMark, the 500GB hard drive recorded a read rate of 106 megabytes per second (MBps) and a write rate of 108MBps. These are exceptional rates that were backed up in our own file duplication test, in which a rate of 51.7MBps was achieved. During everyday use, the VivoBook proved to be zippy; we didn't experience long waiting times when loading applications or trying to access system menus, and multitasking with browsers, media players and photo editing software was a breeze. A fair bit of software comes pre-installed on this notebook, which works frequently in the background. One is a trial version of McAfee antivirus software, and another is ASUS' own update utility. Before using this notebook for your everyday work, make sure that you run the latter to ensure that the system has all the updates for its drivers so that it does not keep asking you to run it. Or just uninstall it. We ran it so as to get the latest drivers for the notebook's touchpad and in the process it got a few other bits and pieces, which meant that we had to restart the system a handful of times. It was a slow process. 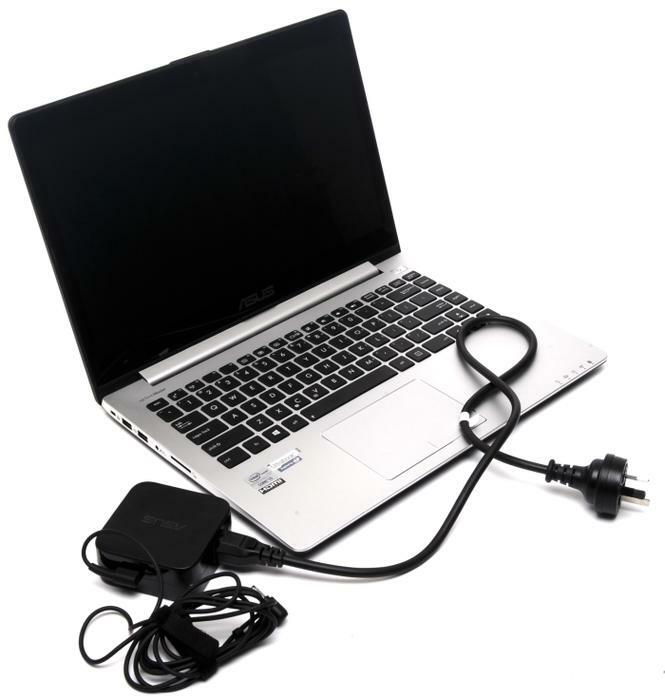 If you plan to use this notebook while on the road for work, or while lying in bed away from a power outlet to watch a movie, its battery will supply you with a good amount of time. In our rundown test, in which we disable power management, enable Wi-Fi, maximise screen brightness and loop an Xvid-encoded video, the VivoBook's battery put up an impressive showing of 4hr 5min. To put it in perspective, this time is 26min more than the HP Envy Touchsmart 4, which is also a 14in model with a 3317U CPU, and 17min less than the Samsung Ativ Smart PC Pro, which is a 13.3in model with an Intel Core i5-3317U CPU. You can get a lot more out of this ASUS if you use a lower screen brightness or dimming, a balanced power profile, and if you let the screen go blank during idle times. The power supply is in between a wall-wart and a power brick in size and its cables could stand to be a little longer. Speaking of the screen, it's a mixed bag. We like the fact that it's a touchscreen, even though this adds a little to the overall weight due to the protective cover in front of it, but its vertical viewing angles could be better. It will also reflect a lot of light, which can make it annoying to use in bright conditions. But as for the touchscreen itself, it has a 1366x768-pixel resolution, which is standard for a notebook in this price class, and it was accurate and responsive when we used touch. We were easily able to tap on big and small targets and swiping gestures were recognised without us having to make many second attempts. The only problem is that because this Ultrabook isn't a tablet-style hybrid, you can't use it as a tablet. The screen has the capability to recognise up to 10 simultaneous inputs, but you'll probably only end up ever using one, maybe two. The does not tilt back all the way so that you can use it while it's sitting flat on a desk, nor does it rotate or come off the base. Basically, the touch on this panel is used to supplement navigation while using the notebook in a regular way. You probably won't want to use it to play touch-based games or even to interact with the interface for prolonged period of time, which could get tiring, but you might want to use it now and then to tap on something or drag something around the screen without using the touchpad. It's also great for navigating the Windows 8 Start screen and launching apps from there. 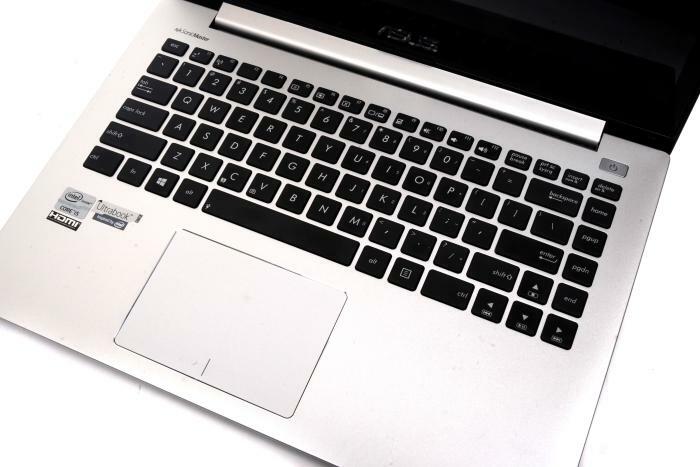 The VivoBook's touchpad is a massive ASUS Clickpad with dimensions of 105x74mm, and this leaves plenty of space for Windows 8 swipe-in activities, as well as multi-finger gestures such as two-finger scrolling and three-finger flicking. However, while the pad performed adequately during our tests, using three-finger flicks in Firefox didn't work (they worked in other browsers and parts of the system that we tried), even after updating the drivers. The driver for the touchpad can only be accessed from the utility that plonks its icon in the System Tray area and it doesn't have much in the way of settings. It's one aspect of this Ultrabook that could use some improvement considering the touchpad is a component you'll have to use so regularly. The 14in form factor of the S400C makes it perfect for long typing sessions. The palm rest is big, as is the chiclet-style keyboard, which we found it to be comfortable overall. The keys feel soft and are not a chore to press, and they travel just enough to provide a decent level of responsiveness. There aren't any keys in awkward positions, although we did have to get used to the Home, End and Page keys being just to the right of the Backspace and Enter keys (even though many laptops use a similar layout these days). It's not a backlit keyboard, which is a bit of a sore point for us, but considering the Ultrabook's price point, we're not too mad at this omission. The price point is also the reason why the wireless adapter is not a dual-band model, but instead a single-band, 802.11b/g/n module (a Qualcomm Atheros AR9485WB-EG). The roomy keyboard and touchpad. If you can find this Ultrabook for just over $800, then grab it. It's a good unit overall, with plenty of speed and a decent touchscreen that allows you to perform Windows 8-centric tasks a little more efficiently than a non-touchscreen-based notebook. We like its style and think it has a good range of connectivity built into it, too. We think it's worthy of consideration if you're a student looking for something capable for uni, or if you're a business person who wants an inexpensive Ultrabook that can be used in the office or at home.